The Trump administration on Monday is set to re-impose the first batch of Iran sanctions since the U.S. withdrew from the nuclear deal. The more significant tranche of sanctions, including on oil sales, won't come back into force until November. But Monday's action fires a shot across the bow, telling businesses, European allies and Iran that President Trump is serious about keeping the United States out of what he's called the "worst deal ever negotiated." Trump announced in May that he was withdrawing the United States from the 2015 accord with Iran, Germany, France, the United Kingdom, Russia and China. The deal, negotiated by the Obama administration, lifted sanctions on Tehran in exchange for curbs on its nuclear program. [post_ads]Rather than immediately re-impose sanctions in May, the Trump administration gave companies doing business with Iran two "wind-down" periods. 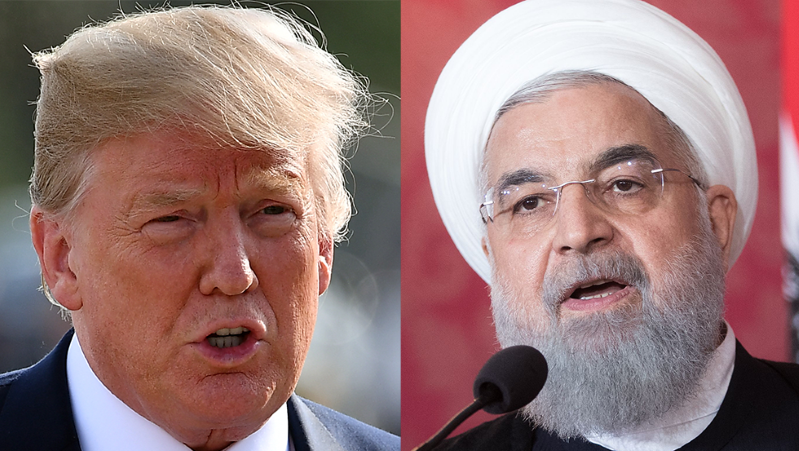 Since the May announcement, administration officials have left the door open to sanctions waivers, but have been working to convince businesses to cut ties with Iran and have warned they won't hesitate to sanction even those in allied countries. The more significant wind-down was a 180-day period that ends Nov. 4. Sanctions that can be put back into place on that date target Iran's energy and banking sectors. Monday ends another, 90-day period after which the U.S. can sanction transactions with U.S. dollar banknotes; trade in gold and precious metals; direct or indirect sales of graphite, raw or semi-finished metals; and Iran's automotive sector. Most of the sanctions in the first batch are "fairly modest stuff," said Richard Nephew, former principal deputy coordinator for sanctions policy in the Obama administration's State Department. "In terms of practical impact, they'll be more symbolic than anything else," added Luke Coffey, director of the Allison Center for Foreign Policy at the conservative Heritage Foundation. Nephew highlighted the automotive sanctions as one of the more significant in the group since Iran had ambitions for auto exports to become a bigger part of its economy. Though Monday's sanctions aren't designed to be a "crippling hammer blow on Iran's economy," Nephew said, they do send a message. "One of the things I've heard an awful lot of over the course of the last couple of months is whether or not this is still all a feint and all intended to rejuvenate the diplomatic process that had otherwise been stalled," he said on a conference call with reporters. "I think that come Monday, a lot of that speculation, a lot of that wishful thinking will have been put to rest when those sanctions are back in place." The sanctions will go back into place after Trump first threatened and then expressed an openness to meet with Iranian President Hassan Rouhani, and as the Pentagon is monitoring Iranian military exercises in the Persian Gulf. Last month, when talking about Iran's right to the Strait of Hormuz, Rouhani commented that Americans "must understand that war with Iran is the mother of all wars and peace with Iran is the mother of all peace." Trump responded by issuing an all-caps tweet directed at Rouhani. "NEVER, EVER THREATEN THE UNITED STATES AGAIN OR YOU WILL SUFFER CONSEQUENCES THE LIKES OF WHICH FEW THROUGHOUT HISTORY HAVE EVER SUFFERED BEFORE," Trump wrote. "WE ARE NO LONGER A COUNTRY THAT WILL STAND FOR YOUR DEMENTED WORDS OF VIOLENCE & DEATH. BE CAUTIOUS!" This past week, though, Trump said he'd be willing to meet with Iranian leaders without any preconditions. "It's good for the country, good for them, good for us and good for the world. No preconditions. If they want to meet, I'll meet," Trump said at a joint press conference with the Italian prime minister. Secretary of State Mike Pompeo later that day said he is on board with Trump's comment, before adding that Trump is prepared to talk "if the Iranians demonstrate a commitment to make fundamental changes in how they treat their own people, reduce their maligned behavior, can agree that it's worthwhile to enter in a nuclear agreement that actually prevents proliferation." And while Pompeo and Iranian Foreign Minister Javad Zarif were both at a regional forum in Singapore this weekend, State Department officials said ahead of the conference the two had no plans to meet. Trump's whiplash between threats and diplomacy prompted déjà vu for some who saw similarities to how Trump approached North Korea. In that case, Trump threatened "fire and fury" before holding a summit with North Korea leader Kim Jong Un. Iran experts are skeptical Trump could repeat that formula with Rouhani. "To the extent that this is Trump's trying to replay the North Korea game, where you take a problem, turn it into a crisis, throw in some irresponsible belligerent rhetoric, and then do some diplomacy that doesn't achieve much but allows you to declare victory, I think that there are two big flaws with that cut and paste job," Jarrett Blanc, former Obama administration State Department coordinator for Iran nuclear implementation, said on a conference call. He cited both internal Iranian politics making it difficult for Tehran to cooperate with Trump and U.S. politics making it difficult for Trump to sell anything less than full success back home. Coffey, at Heritage, said the approach to Iran has to be "completely different" from North Korea. "North Korea already has a nuclear weapon and is more isolated form the international economy, the international stage, whereas Iran is pursuing a nuclear weapon and, I know it sounds extraordinary to say, but compared to North Korea is more integrated into the global economy," he said. "Plus the difference is there's sort of international consensus on North Korea whereas Iran is slightly divisive because Europeans are still wedded to the deal." Coffey said he believes Trump's withdrawal from the Iran deal was an "opening gambit" for a new deal. Whether that works might become apparent between Monday's sanctions and the sanctions set be reimposed in November. "Who knows exactly where this is going, what sort of meeting might take place or not take place," he said. "But the rial is plummeting, the Iranian economy is in deep trouble, and it wouldn't surprise me if before the six-month mark, we see some movement from the Iranian side to try to renegotiate the deal."